The newest theme park lands, Star Wars: Galaxy' Edge, is ready for you starting from 31 May. Book tickets in advance and live out your own Star Wars story! Explore both the classic Disneyland Park and Disney California Adventure Park, each featuring unique rides and attractions for kids of all ages! Try out all the classic Disney rides like Space Mountain, It’s a Small World, Indiana Jones Adventure, and more! Meet all your favorite Disney friends like Mickey Mouse, Goofy, Donald Duck, and more! Experience the magical world of Disney at the original Disneyland in Anaheim, California. This is Walt Disney’s first theme park and has brought happiness to kids of all ages for generations. Visitors to Disneyland can choose from 2 spectacular parks, the original Disneyland Park and Disney California Adventure Park. Each park features unique attractions and experiences. 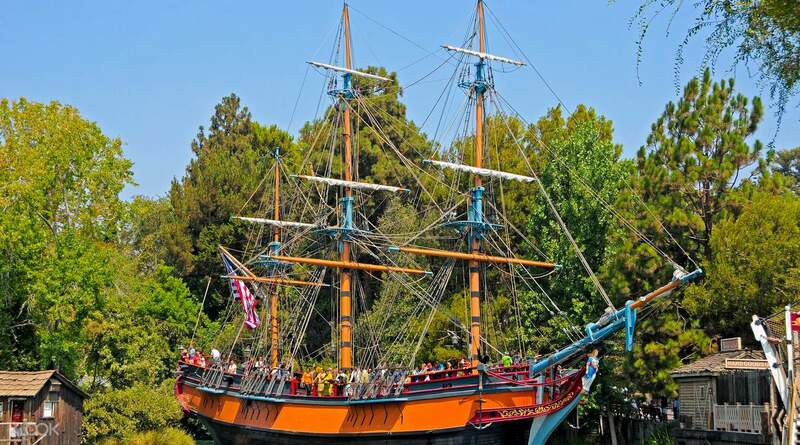 Disneyland Park has all the original Disney magic and includes famous rides such as Space Mountain, Pirates of the Caribbean, It’s a Small World, and more! Don't miss the newest attraction Star Wars: Galaxy' Edge (available from 31 May 2019). 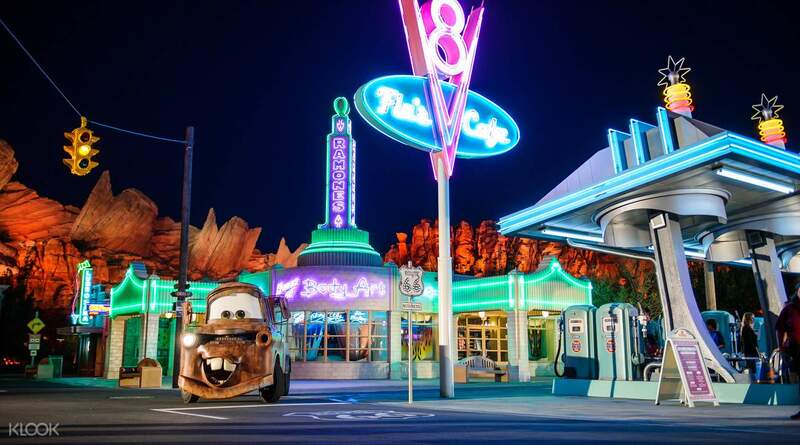 Disney California Adventure is a celebration of the history and natural beauty of the great state of California, USA. You’ll have the chance to meet all your favorite Disney characters at both parks, including Mickey Mouse, Goofy, Donald Duck, and Pluto! New additions to the Disney family are also featured in both parks and you’ll find rides, experiences, and attractions from Marvel, Star Wars, Pixar Animation, and more! There is something for the whole family and for kids of all ages! For first time visitors, please note that the 2 parks are considered separate theme parks. If you want to experience the magic of both locations, please purchase a Park Hopper pass or visit each park on separate days using single park entry tickets. Meet all your favorite Disney characters like Mickey, Minnie, Goofy, Donald Duck, and more! Relive your favorite Disney movies in Adventureland! Need a ride? 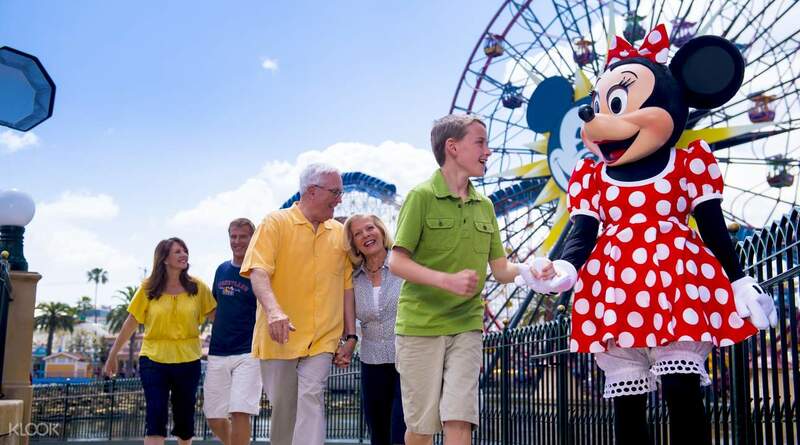 Check out the Shared Mini Coach Transfers between Los Angeles and Disneyland® Park! I got the 1 Day Single Park Ticket, couldn't upgrade to a 1 Day Park Hopper via Klook but was able to upgrade at the park itself for $60. Would've saved more if I got the Park Hopper in the first place, but I can live with it. Disneyland and Disney California Adventure are right across each other, which is so convenient. We spent more time in DCA since it was less crowded -- got to meet more characters and get their autographs, go on rides, etc. I enjoyed the sights and shopping more in Disneyland. Both parks are equally unique and truly worth visiting. I got the 1 Day Single Park Ticket, couldn't upgrade to a 1 Day Park Hopper via Klook but was able to upgrade at the park itself for $60. Would've saved more if I got the Park Hopper in the first place, but I can live with it. Disneyland and Disney California Adventure are right across each other, which is so convenient. We spent more time in DCA since it was less crowded -- got to meet more characters and get their autographs, go on rides, etc. I enjoyed the sights and shopping more in Disneyland. Both parks are equally unique and truly worth visiting. 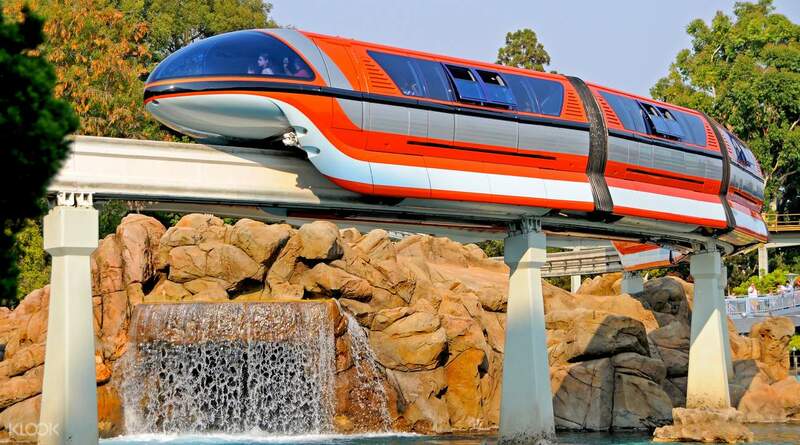 It was an amazing experience in getting the 1-Day hopper ticket with the use of Max Pass to enjoy most interesting and exciting rides and shows in Disneyland and Adventure Park! Just a bit sad with no firework during Mon-Thu, so it is hoped the renovation of the princess castle would be complete ASAP. It was an amazing experience in getting the 1-Day hopper ticket with the use of Max Pass to enjoy most interesting and exciting rides and shows in Disneyland and Adventure Park! Just a bit sad with no firework during Mon-Thu, so it is hoped the renovation of the princess castle would be complete ASAP. Really amazing experience, lots of people although it's low season. I'll advise to go for more than 1 day if you want to experience everything. Expect lots of waiting in line. So make sure you use the fast pass wisely to plan the rides, then wait for Parade at 3.30 or 6pm and the fireworks at 9pm. You still can go take the rides after the fireworks, less people. Really amazing experience, lots of people although it's low season. I'll advise to go for more than 1 day if you want to experience everything. Expect lots of waiting in line. So make sure you use the fast pass wisely to plan the rides, then wait for Parade at 3.30 or 6pm and the fireworks at 9pm. You still can go take the rides after the fireworks, less people. I had spent my Christmas day with my family in "The Happiest place On Earth" - Disneyland Park California. It recalls a lot of my childhood memories. The Christmas parades and fireworks are so awesome. I'm sure will visit this wonderful place again. I had spent my Christmas day with my family in "The Happiest place On Earth" - Disneyland Park California. It recalls a lot of my childhood memories. The Christmas parades and fireworks are so awesome. I'm sure will visit this wonderful place again. Highly recommend to buy ticket in here to avoid long lines. Easily to budget the whole trip. Recommendation to visit on Wednesday, during winter break and come early as the park are open 7.30am because it’s less people and not too hot. More recommend to bring your own picnic food if you’re planning to stay longer in the park because all the food inside are pretty pricey. During my trip, I reached early as less people inside the park which is easy for you to take a lot of nice and beautiful picture and less people to lineups every each attraction. Welcome to visit my ig:aimykim9 to see a lot of beautiful pictures in Los Angeles. Highly recommend to buy ticket in here to avoid long lines. Easily to budget the whole trip. Recommendation to visit on Wednesday, during winter break and come early as the park are open 7.30am because it’s less people and not too hot. More recommend to bring your own picnic food if you’re planning to stay longer in the park because all the food inside are pretty pricey. During my trip, I reached early as less people inside the park which is easy for you to take a lot of nice and beautiful picture and less people to lineups every each attraction. Welcome to visit my ig:aimykim9 to see a lot of beautiful pictures in Los Angeles. Cheaper tickets from KLOOK compared to buying from Disney. Easy access, just by showing the e-ticket at the entrance gate and you’re given a physical Disney ticket. You can also purchase Maxpass for USD10 from the Disney app by scanning the physical ticket in. Cheaper tickets from KLOOK compared to buying from Disney. Easy access, just by showing the e-ticket at the entrance gate and you’re given a physical Disney ticket. You can also purchase Maxpass for USD10 from the Disney app by scanning the physical ticket in. I love purchasing tickets with the Klook app! It’s easy, convenient and reasonably priced. This is my second Disneyland Park ticket purchase with Klook. The first one was from November 2018 for Hong Kong Disneyland. I love purchasing tickets with the Klook app! It’s easy, convenient and reasonably priced. This is my second Disneyland Park ticket purchase with Klook. The first one was from November 2018 for Hong Kong Disneyland. Klook is amazing! No need to wait in line, just head straight to the gate to have the ticket scanned, and you're good to go. There is no hassle at all and it makes everything easier. This ease of redemption surely helped me enjoy my time in the happiest place on earth! For all ticket purchases, be sure to choose Klook! Klook is amazing! No need to wait in line, just head straight to the gate to have the ticket scanned, and you're good to go. There is no hassle at all and it makes everything easier. This ease of redemption surely helped me enjoy my time in the happiest place on earth! For all ticket purchases, be sure to choose Klook! Disney was amazing. The kids had fun we had the hopper ticket and it was a breeze going in and out of both parks. Got our tickets from klooks and it was smooth received our etickets instantly which was then exchanged at Disney park for the real ticket. The price was very reasonable too compared to other sellers. Would definitely buy and highly recommend Klooks to everyone. Thank you Klooks. Disney was amazing. The kids had fun we had the hopper ticket and it was a breeze going in and out of both parks. Got our tickets from klooks and it was smooth received our etickets instantly which was then exchanged at Disney park for the real ticket. The price was very reasonable too compared to other sellers. Would definitely buy and highly recommend Klooks to everyone. Thank you Klooks.